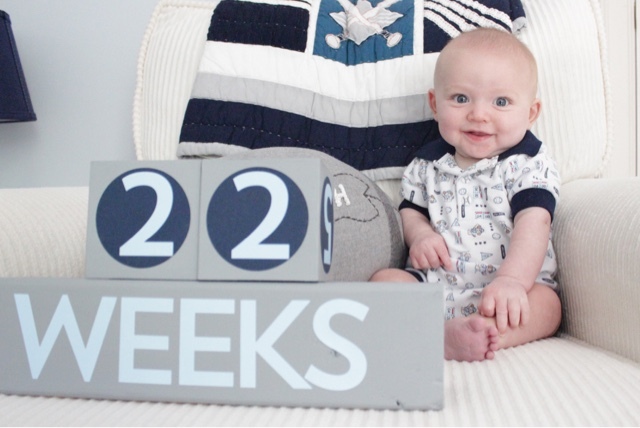 Gah, this boy! I could just eat him up. Look at how he is posing and everything! We had a fun week! 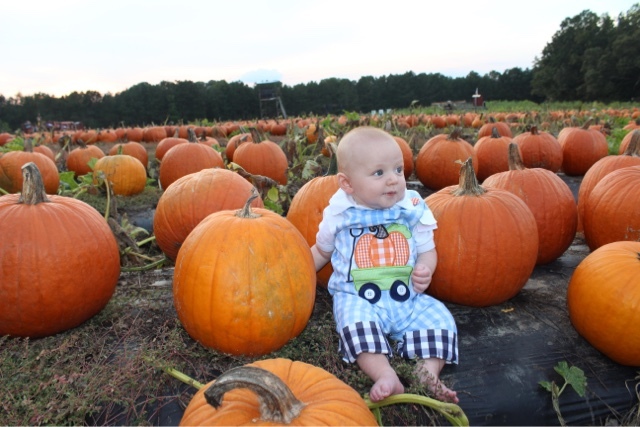 Last Friday we visited the pumpkin patch! Ella kept picking up every small pumpkin she could lift and putting them in our wagon. I think we had about 10 little pumpkins in there at one point! 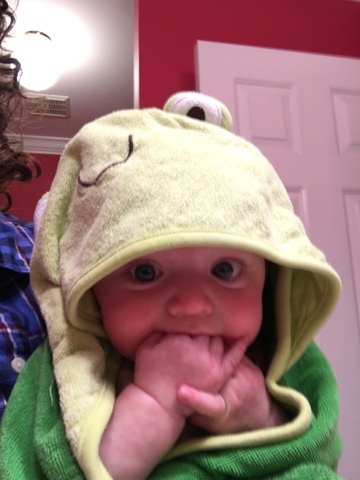 This little froggie had a nice bath after rolling around in all that dirt. Ok, so he wasn't exactly rolling around in dirt at the pumpkin patch....but I just love a clean baby in a hooded animal towel, don't you?! The next morning, we put on Ella's Halloween costume to go to a special cupcake decorating event with Mackenzie! Ella is a dalmatian, but is telling everyone she is Marshall from Paw Patrol. Anyway, the girls had so much fun making special Halloween cupcakes! The baby brothers had fun too! Lucas and Cooper had matching shirts!! Lucas spends at least half of his waking hours like this! Ha! Another exciting event this past week was on Tuesday when Lucas tried rice cereal for the first time! ...but ultimately, he loved it! 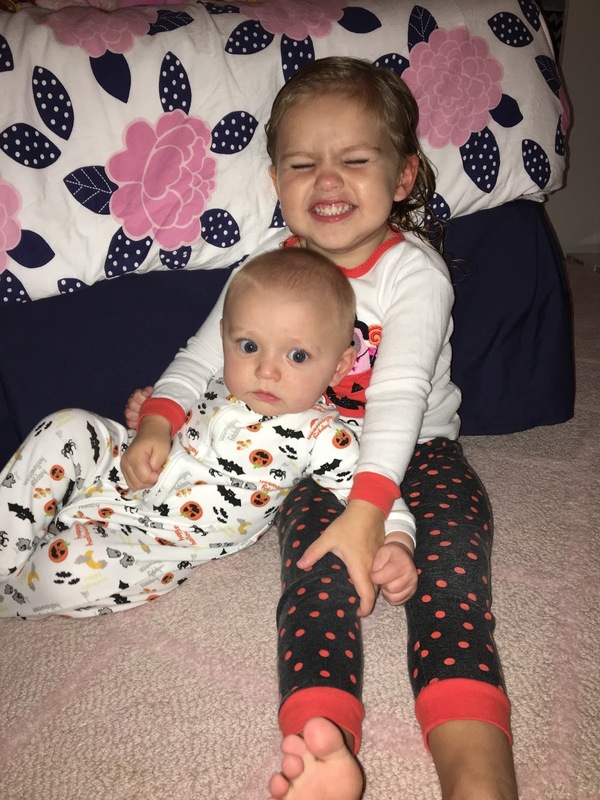 After that, the kiddos got a bath together and wore their Halloween jammies, because Ella is in this stage where she wants Lucas to do every. single. thing. she does. I guess its cute? Last but not least, I am finishing up Lucas's Halloween costume and found him a hat this week! Yes, I could have totally ordered a firefighter costume but I had some mom guilt about making his, since I made Ella's costumes the past 2 years. I LOVE their pumpkin outfits at the patch!!! So cute!! Where is your top in the pumpkin patch pictures from? Love it!